This fun weekend was a couple of weeks ago but I still wanted to share it! Corso's Greenhouse in Sandusky is just a feast for the eyes, no matter what time of year! But this poinsettia display was really beautiful ~ and I just noticed the "Peace" sign in the upper right of the photo ~ so appropriate right now. Friday night was the first of our festivities and it was the Annual HomeBuilders Christmas dinner. Sonny will be the new Vice President and his son, Brian, is the President and my son, Ted, is a Board member. Is that nepotism? Do I even know what the word means? At any rate, they are all hard working guys and I'm proud of their service to our organization! Can you see the glimpse of my sparkly headband? Another older gal we know was sporting a glittery headband this summer and I thought it was cute ~ so I gave it a whirl!! Sonny said it was better than if I wore a hat ~ there may have been a compliment in there somewhere! Saturday night, we were invited to join our Kelley's Island friends at Chez Francois in Vermillion for an anniversary celebration! We love it there and this was the dessert presentation. Beautiful! We had the truffle dinner ~ one of their specialty offerings that had truffles in every course!! Lots of different kinds of truffles and things served with truffle oil and truffle honey and this was truffle ice cream! It was quite a dining experience ~ you might call it a once in a lifetime affair and we all loved it! for dinner ~ well, we had steak for dinner but they joined us! See their reindeer 'ears' ~ they really get into the season!! And since we were dining at the lake place, friends Diane and Greg joined us, too! We had a fun evening to top off our big weekend and we loved every minute of it!! Last week, Sonny and I were out every night with friends or family ~ this week is a different story! I'm just trying to stay alive and get well enough for the Seattle family! They're arriving Saturday at noon and it will be high times for the next week! We're going to work a family photo in and celebrate Tad's birthday at the end of the week!! There will be lots of coming and going and cooking and eating and lots of Christmas cheer, I'm sure!! Today, I hope to put out a few decorations ~ this house is not very Christmasy, other than the tree!! Sounds like we might be in for some snow, so a trip to the grocery might be in order along with getting Tad out to do his shopping! Holy crow ~ I have no time for the "Christmas Crud" that has taken me over!! I'm sure most of you are ready and enjoying your days ~ know that I envy you!!!! It's always like Christmas was a surprise at our house!! But we've never missed one yet!! 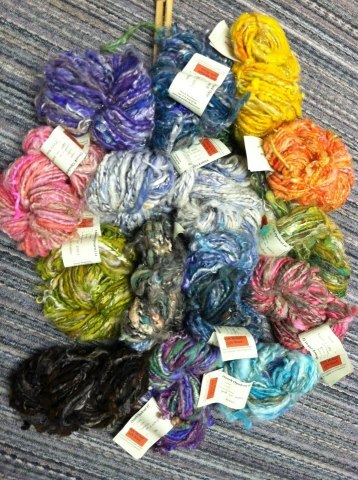 BEAUTIFUL handspun yarns ~ see anything you like? They are $32 a skein ~ will be happy to send it out! This chunky handspun gives great texture and color to hooked rugs and a skein of it knits into a greally luxurious scarf!! Merry Christmas!! House is all clean now (thanks to Tami) and maybe I can get a little decorating done!! These are pretty colorful ~ maybe I'll drape them here and there for a little local color!! Thanks to Sonny, this is our one and only Christmas decoration! I have had a miserable cold since Friday evening and have done nothing productive (other than knitting!). Maybe today! He also made jars and jars of jam on Sunday ~ peach, blackberry and blueberry! He picked and gathered during the season and froze it all in batch amounts so he would be ready when he had time. I swear, he can work circles around me!! 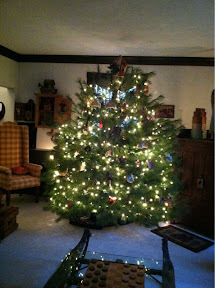 Might I add ~ this is the FATTEST tree we've ever had ~ it's a monster!! Last week, miss Luci turned 10 years old! 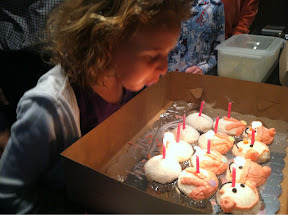 Her mom's friend made these darling snowman cupcakes ~ not only did they look great, they were very tasty! On Friday, Luci had her tonsils out ~ all went well and she's on the mend!!! She had a big week! 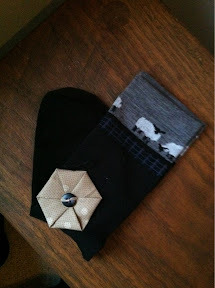 In the mail last week, I received these sheep socks and little pinwheel ornament from a rug hooking friend! Thank you, Charisse ~ you are such a thoughtful gal!! Saturday, son Chris and family are coming from Seattle! I sure hope this creeping crud that I'm afflicted with goes away before then!! Lots to do is an understatement! One little fun tidbit about my charming Mr. Kitty ~ he's eating the pine needles and they make him sick!! Need I say more? And he dumped a container of Kyolic garlic capsules that I take and I think he may have eaten some of those!! And the ones he didn't eat, had chew marks on them! Nice kitty!! Hope you're all having a good pre-holiday week!! Tonight's project was a scarf ~ my first!! I've knit one other project so I went to my Pinterest boards for refresher tutorials on casting on and binding off and voila! 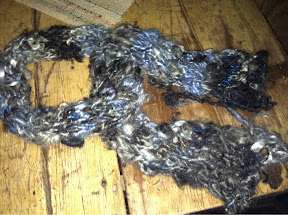 A scarf was born! This is a skein of Ozark handspan that has lots of texture and color variety. I'd like to tell you I whipped this right out but I had a false start. It was too wide and after a good bit was on the needles, I knew a skein wasn't going to do it - so I pulled it all out and cast on six stitches instead of twelve ( my own plan - no pattern) and ended up with a nice long neck warmer!! I am a little bit proud of my evening's project. I'm getting a cold and feel kind of crummy so decided I would do something to take my mind off it ~ it worked just swell!! Now, I'm slathered in Vicks and dosed with Motrin and off to my bed!! Night all!! 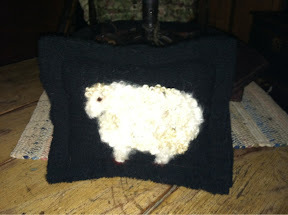 At 5:20, I went to my studio and made this little needle felted pillow for a hostess gift! 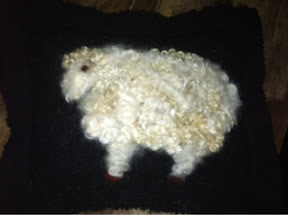 He's made of Wensleydale sheep fleece that we brought back from England six years ago ~ felted into heavy black wool, stitched together and stuffed with wool snippets from my rug hooking! Notice his red hooves!! We were invited to our friends, Diane and Lou Hart, to see their log home built from three antique log structures. This is the family room fireplace ~ the surround is made of HUGE stones salvaged from a house of days gone by. 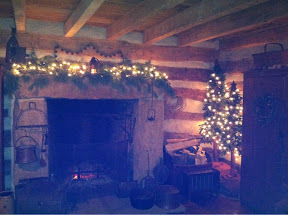 There were 30 + trees throughout the home and the ambiance was just breathtaking! The approach up the driveway with lighted trees and fence rails set the stage for a wonderful evening in the dimly lit home with a fire blazing and soft Christmas music in the background! Their home was written up in the Christmas 2011 Early American Life magazine. If you have it, take your own tour and know that we were thrilled to see it firsthand! This is a better shot of the little pillow hostess gift ~ yes, I went down at 5:20 and whipped it up to go along with us for our 6:30 visit to Diane and Lou's!!! My days are hectic and intentions were to make it earlier but true to my nature, it happened practically on the way out the door! Diane loved it and I was so glad it came together! Makes me wonder why I don't do more of that kind of thing! The answer is that I'm most creative when under a deadline! Granddaughter Luci had her tonsils out this morning and what a little trooper she was! I went to the hospital to stand watch with her parents (son Teddy and mom Miki) and Aunt CC and Aunt Beth. As soon as she was awake and eating popcicles, we all cleared out and left Miki to handle the rest! Tonite, she is home and so far, so good!! Our Seattle grandson, Hunter, and family are in Reno, Nevada tonite in preparation for Hunter to play for Team Washington in the Football University games comprised of some of the best 7th grade football players in the country! They played and won two games last weekend in Oregon and need to win tomorrow in order to advance to Sunday's game. Hunter is the starting quarterback and seems to have a fine future ahead of him! Go Hunter ~ grandma's here in Ohio with her pom poms cheering you on! And while we're elated with all the blessings in our lives, we are definitely sad about the tragedy at Sandy Hook elementary school. There are no words to express our sorrow for all those children and families that have been touched by such an atrocity. As we lay our heads down tonite, we pray for their peace and strength in the coming days ~ wishing that our prayers would change things for them all. 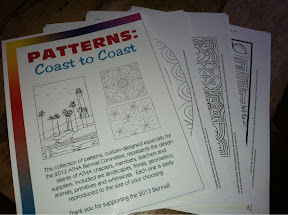 Just received my package of ATHA patterns being sold to help fund the 2013 Biennial in California! There are about 60 patterns that can be enlarged to any size and I like a lot of them ~ there's something for everybody's hooking style! Go to the ATHA website and click on 'fundraising' and it will take you to the order page! A great way to support ATHA and add to your pattern stash, as well! It would be a perfect day to hook ~ foggy and gloomy here in Ohio ~ but instead, I'm off to a Christmas tea, among other things ~ like scrubbing the carpet at a rental ~ and planting some daffodil bulbs that should have been planted in October ~ but it's going to be 63 deg. here today, so aplanting I will go!! Have a good day!